Planning a workshop or a presentation and looking for meeting rooms in Dublin near Naas Road and M50? The 4 star Red Cow Moran Hotel is the obvious choice. Getting a presentation ready can be a stressful task. Whatever the purpose of your workshop, educational, relationship building, brainstorming or problem-solving, our experienced team will help you to organise everything on your agenda, making sure your event runs smoothly. 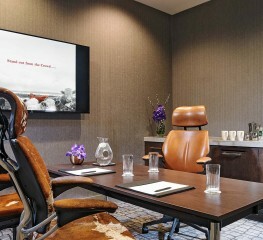 A lot of thought goes into selecting the perfect venue for a seminar or presentation and with 21 unique event spaces, the 4 star Red Cow Moran Hotel near M50 offers you a range of settings appropriate to your event type. We can cater for events of all sizes for up to 800 attendees and our meeting rooms are equipped with everything you might need for a successful event. 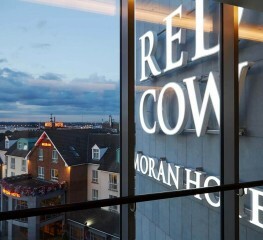 The 14 new event spaces at the Red Cow Moran Hotel – each named after a different breed of cattle, such as Charolais, Angus, Dexter and Friesian – have high speed wireless internet access, screen sharing technology, large LCD screens of up to 97 inches, are fully air conditioned with natural daylight and have access to the hotel’s courtyard garden. 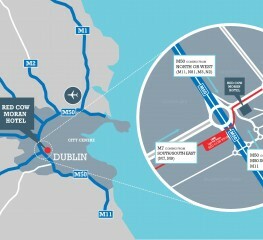 Add to this, 315 executive style bedrooms, 4 bespoke long term apartments, a choice of bars and restaurants including a brand new Link Lounge with coffee dock and wine bar, Tom’s Table Restaurant, a new fitness suite and courtyard garden, the Red Cow Moran Hotel ticks all the boxes for the perfect conference venue in Dublin.